Casey Jolomi Edema was born in Zaria, Kaduna State, where he spent most of his formative years. As a child, Casey’s love for music was evident, leading to his joining his local Church Choir at the age of ten. “Come And See What The Lord Has Done” is a simple soul lifting, worship chorus, that everyone can sing and should sing. Everyone who is a child of God has a testimony… the very fact that one is born again is a testimony! The song is a testimony of what God has done, his goodness, greatness and ability. It is a song of the Spirit… The Mimshack Song and will inspire and create testimonies in the lives of those who would listen to the song and worship God with it! 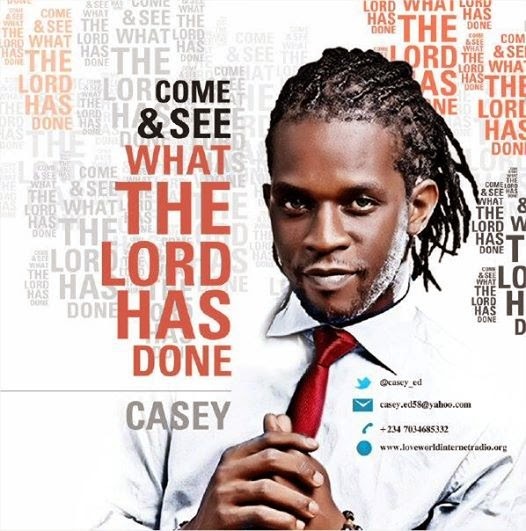 Written in Asaba in 2008, the song was birthed of the Holy Spirit and delivered with Casey’s distinct sonorous voice and style. The blend of flutes, local drums and strings creates a deep reflective feel that engages the spirit of the listener.